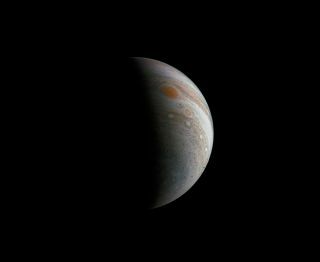 Using data from NASA's Juno spacecraft, a citizen scientist created this photo of a half-lit Jupiter. NASA's Juno spacecraft has been orbiting Jupiter since 2016, beaming back spectacular pictures of the largest planet in our solar system. See those amazing Jupiter photos in our mission gallery here. This Image: Citizen-scientist Gerald Eichstadt processed this image of Jupiter's south polar region, which highlights the distinctive cloud bands that wrap around the gas giant. Read the full story behind this image here. A cyclone swirls through Jupiter's North North Temperate Belt (NNTB) in this new photo from NASA's Juno spacecraft. The NNTB is a prominent band that circles the planet near its north pole. Embedded in this red-orange band of clouds is a gray-colored anticyclonic storm that spins counter-clockwise, or the opposite direction of the movement of other gases in its surroundings. Juno captured this view during a close flyby of Jupiter on May 23, 2018, when the spacecraft was about 4,900 miles (7,900 kilometers) from the planet's cloud tops. Citizen scientists Gerald Eichstädt and Seán Doran created this image of a massive Jupiter storm known as NN-LRS-1 using data captured by NASA’s Juno spacecraft on July 10, 2017. Another raw JunoCam image of Jupiter’s Great Red Spot captured during Juno’s July 10 flyby, which brought the probe within 5,600 miles (9,000 kilometers) of the storm’s cloud tops. This true-color image shows what Jupiter’s Great Red Spot would look like to a human observer from the position of NASA’s Juno Jupiter orbiter. Citizen scientist Björn Jónsson created the photo using data from Juno’s JunoCam imager. NASA's Juno spacecraft captured this image of Jupiter's cloud bands. These bands extend more than 1,000 miles (1,600 kilometers) into the planet's interior, studies suggest.